Fraser is the largest sand island on earth, which means, there is not much solid ground. All vehicles there have four wheel drive and of course they need it. Surprising to me even rainforest stocks on the pure sand - wonder where the water comes from. Indeed there is enough to fill a couple of lakes, croc-free and absolutely clear. Clear is another word for almost dead, dead by nature. During a longer walk through the reed I couldn't even find a bug. I guess the lakes get filled by rainfall, the water slowly trickles away taking the nutrients with it. 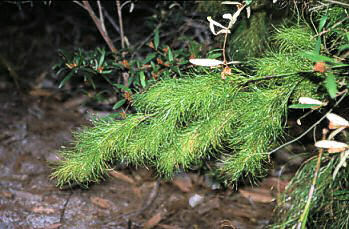 A plant that obviously likes such conditions is the Foxtail, a plant that grows all over the island. It looks pretty much like an Asparagus, but it's all nice and soft. If you know it's scientific name or more details, please tell me. All I know is, that it's endemic to Fraser. 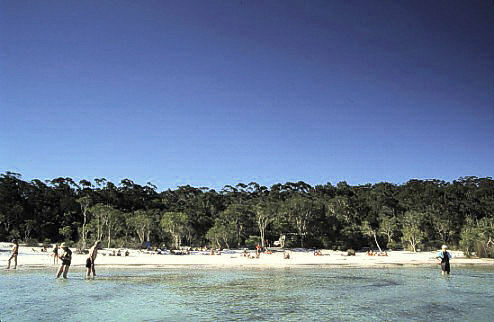 For Fraser Island, we stayed in Kondari Resort.